Terriers extended their winning streak to five games and its unbeaten streak to seven with a 3-2 win against UMass at the Mullins Center in Amherst. Freshman Shane Bowers’ 13th goal was the eventual game-winner for BU, which also received goals from Captain Brandon Hickey and assistant captain Jordan Greenway. With the win, BU takes over sole possession of fourth place in Hockey East, four points behind first-place BC. 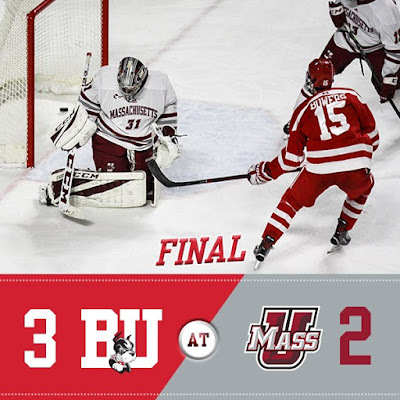 The Terriers got off to an “abysmal” start, according to Coach David Quinn, as UMass outshot BU 11-1 in the first eight minutes en route to taking 16 in the first period. But goalie Jake Oettinger kept the home team off the board—including a standout stop on Mitchell Chaffee breaking in alone— allowing his teammates to steady the ship. Late in the period, on an odd-man rush, slick passes from Bowers and Bobo Carpenter set up Hickey for an even strength goal. A tripping penalty to Greenway in the opening seconds of the middle stanza put the Minutemen on the power play and they quickly tied the score on John Leonard’s wrist shot from the slot. At 14:17, Greenway, who leaves for the Winter Olympics next week, put BU back in the lead on a power play, converting the rebound of Brady Tkachuk’s shot. Dante Fabbro also assisted. BU dominated the third period pouring 18 shots on goal, finally scoring at 7:28. Logan Cockerill took a hit along the left-wing boards to nudge the puck forward to Bowers, who raced up ice and wristed a shot from the left circle past goalie Matt Murray low to the glove side for a 3-1 lead. UMass narrowed the lead on one of its only three shots in the period when Niko Rufo, a transfer from Providence, slid home a rebound after Oettinger’s initial save. Both teams had goals disallowed for goalie interference—UMass in the second period and BU in the third. BU, which allowed only six shots on goal over the final 20 minutes, has now scored a power play goal in its past five games and at least one goal in 13 consecutive periods. 2018 recruits Jake Wise and Tyler Weiss assisted on goals in the NTDP U18s’ 3-1 win over Madison. 2018 recruit Hugo Blixt’s fifth goal of the season was Tri-City’s only score in a 4-1 loss to Waterloo. Charlie Coyle scored his sixth goal in Minnesota’s 5-2 win against Las Vegas. ● NHL.com recap and highlights. Jesse Compher scored BU’s only goal in a 5-1 loss to Vermont at Walter Brown Arena.